The Homeschool Gossip: TEEN SOCIAL DANCE ~ RSVP BY date has been extended! 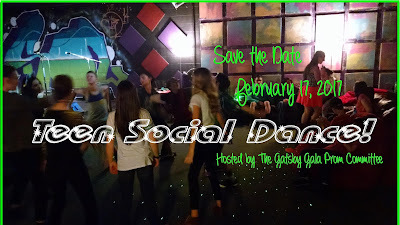 TEEN SOCIAL DANCE ~ RSVP BY date has been extended! The Gatsby Gala Prom Committee is hosting a TEEN SOCIAL DANCE! WHO: Ages: High School Freshmen and UP. This is open to all homeschoolers, their friends and alumni! Come and meet some people, have some fun and learn some line dances! This is a casual dance. A great opportunity to hang out with friends and meet some new ones. There will be tables for visiting, snacks and drinks. Please note: you don't have to be going to Prom to attend this dance! This dance is a chance to get to know other teens in our area and to have some fun! Looking for more Teen Events like this? Like the LKNsec Gatsby Gala 2017 Prom facebook page and subscribe to our events for latest news of our Teen Socials! Also, you can check out The Homeschool Gossip Teen Scene Calendar and THSG Teen Scene Social Club on facebook!